I saw a similar problem on this site, but mine is a bit worse. It happened over the winter. No tears in the wall are present, YET. The pool is about 13 years old. Great condition, other than this section of the wall, and maybe the liner. Just wanted to see if you think we should be able to bang this out with the old hammer and 2x4 method, and if the liner will be reusable. It has been completely empty for over a year. Any input, Greatly appreciated! Hi Chris. I feel certain you could straighten the wall and be just fine. As far as the liner goes, there is no way I would try to reuse it. It has been empty for to long and will have shrunk and become brittle. Don't hesitate to reinforce the worst areas of the wall by taping flat stock metal to the inside of the wall. A little reinforcing makes a big difference, and eliminates the chance of the creases coming back. 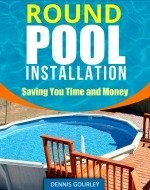 Before you begin any repairs you may want to check the prices for pool only kits. 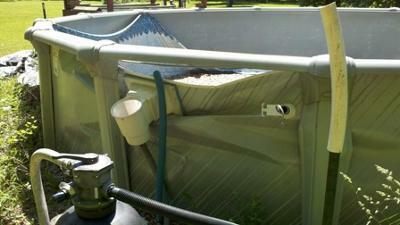 Especially online above ground pool kits. All you need is the pool and the liner, not all that extra stuff. While you are checking pool prices you may also want to check the price of just a wall panel for the skimmer and return. One of these could easily be spliced into your wall, replacing the damaged area. I would use a double row of nuts and bolts on each end of the pane. These should be hid behind your uprights if at all possible. Another option is to invest a couple hundred dollars in a used pool. In my area they are advertised in the paper and on Craigs List all the time. In some cases, they are free if you remove them from the owner's yard. Explore all of your options before making a decision. We have a 24x4ft round above ground pool that is about 14 yrs old. I discovered a couple of pinholes near the top of the liner. I looked under the deck & found that it had caused a rusted area with a hole approx 4" in diameter about 8 to 10" from the top. Is there a way to safely patch this to make it last this season. We live in Indiana & normally are able to swim thru August. We plan to put up a new pool next spring. Hi Gene. A hole in the wall that near the top is probably not something to worry about to much, just keep an eye on it. To patch it you would need to lower the water level to just below the hole. You could then pull the liner back and tape some flat stock metal, or aluminum, to the wall. It is pretty easy to do.